Zerothree is a new record label dedicated to unearthing the undiscovered talent that exists in the online community of dance music producers as well as working with established talent. Run in conjunction with music platform Wavo.me, Zerothree will release an EP from new and unsigned producers every quarter. Wavo and Zerothree will be hosting engaging, crowd-sourced label initiatives like an online demo submissions chart, remix competitions, and more to make the discovery process transparent and interactive. The winning producers will also benefit from being part of a release schedule that is home to possibly some of the most exciting new and established producers in dance music today. The likes of Kaz James, Junior Sanchez, Maor Levi, Lunde Bros and Antonio Giacca are already signed to the label, which has a music policy of credible progressive and melodic EDM. 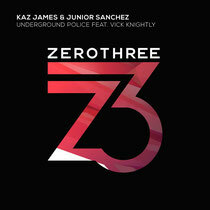 The first release from Kaz James & Junior Sanchez feat Vick Knightly with ‘Underground Police’. Having produced for some of the biggest talents on the planet, holding residencies across Ibiza and Australia and with support including the likes of Avicii, Pete Tong and David Guetta, Kaz James injects his energetic, driving, dance floor inspired sound to the track. Junior Sanchez adds his forward thinking style to the mix and, known for his past releases on Size, Dim Mak and Mixmash, Junior is an exciting producer. It’s out 19 May, check it out below.